Welcome to Just Tyres Bedford. We supply and fit tyres for cars, 4x4s and vans. This means we offer you expert knowledge and a wide choice of tyre brands. Just Tyres Bedford provides a wide range of tyres and tyre fitting at competitive price points. 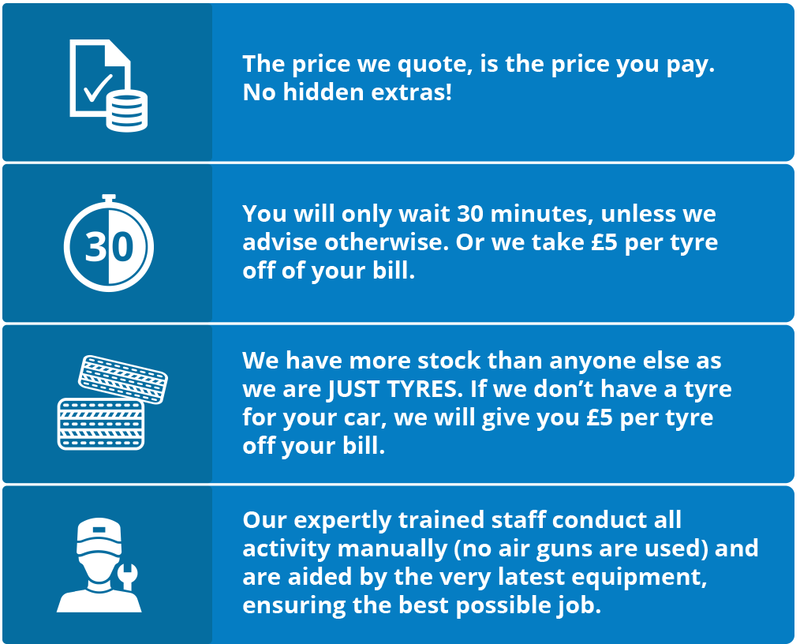 We refund the difference on any tyre purchased within a 20-mile radius of our Bedford tyre fitting centre. You just need to bring us a written quote on the price within 7 days of the initial purchase, while online quotes are not accepted. The Bedford tyre fitting centre is based at 78a Ampthill Road with good parking and conveniently located for your convenience. To buy tyres or to talk to us for some advice, please pop into our Bedford fitting centre today, plus you can also pop in for a FREE Tyre Check. If you would like to buy your tyres online and have them fitted at our tyre fitting centre in Bedford, just click on the Buy Online link and book your fitting day and time during checkout. We regularly provide in store offers and discounts on our quality products, while vouchers for free safety checks can also be used in our Bedford fitting centre. To gain access to our latest deals you only need to enter you information on our website, while our RACS system (Rapid Answer Computer System) allows us to regularly provide immediate quotes on our extensive range of products, and that includes special offers. Each and every one of our products is offered with a 5 year guarantee against manufacturing defects, and this warranty can be activated when you visit our fitting centre with your original invoice. We can begin the process of carrying out the six monthly checks. We pride ourselves on offering safe installations every time, while our workshop is well organised with the clear safety guidelines displayed. Our safety cautious approach means our team hand tighten nuts so you're not left with any issues in the event of a breakdown. This approach also means that we avoid any damage to your wheel nuts or the thread, which is not always the case when airguns are used. Every fitted tyre is correctly seated on the wheel, and we make sure of this by over inflating the tyre and deflating it down to the correct pressure. To get your supreme, safe fitting service, visit our Bedford workshop, we're open 8.30-6pm on weekdays and 8:30am-4:30pm on Saturdays.